Splendide appartement pour hommes daffaires situé en face du Parc des Expositions et du Palais des Congrès de la ville, aménagé dans un édifice cossu des années 60, récemment rénové et possédant une vue imprenable sur Barcelone, composé de deux chambres doubles, deux chambres individuelles, une salle de bains, un cabinet de toilette avec douche et un salon. Totalement équipés, soignés jusque dans les moindres détails. La cuisine du logement dispose de tous les accessoires : vaisselle, couverts, batterie de cuisine, cafetière, presse-agrumes, réfrigérateur, plaque vitrocéramique, four, micro-ondes et grille-pain. Pour rendre votre séjour agréable, le logement dispose de lair conditionné, du chauffage, dune TV de plasma, dune chaîne Hi-fi, dun sol en parquet, et de lave-linge sèche-linge, sèche-cheveux et fer à repasser. Le propriétarie dispose de ses propres conditions par rapport au ménage et clés, si les clients ne les respectent pas ils devront payer des frais supplémentaires. A light, spacious and modern apartment. Clean though fairly basic - but good value. It would have merited an "excellent" evaluation, but: there was only one full-length mirror; two of the bathroom bulbs were faulty; and there was no water or other welcome good on arrival (and there are no local shops open late). it would have been more helpful to provide more details about the address of the apartment. It would have helped to say that it is close to Hotel Fira as we were lost finding the place. 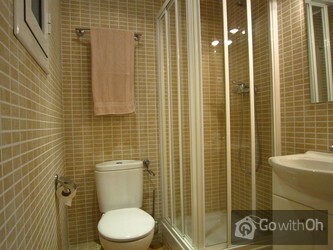 Quiet and safe location, very close to metro station, bus station, and taxis. The apartment was very comfy and beautiful. Nothing to complain about. sms a notre arrivée a barcelone, la personne nous attendait comme prevu et les explixations furent precises . muy bien, de hecho lo hemos recomendado porque ha ido todo bien. Parafaitement bien situé avec la proximité des metros. Appartement bien agencé avec tout le nécessaire pour un court séjour. oh-barcelona Pa s de problème Très sympa et serviable. 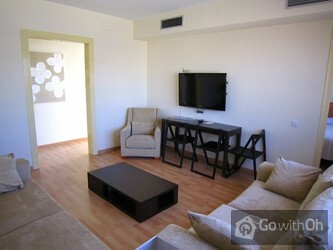 Great apartment in a nice area, comfortable and bright. Nothing bad to say about it. 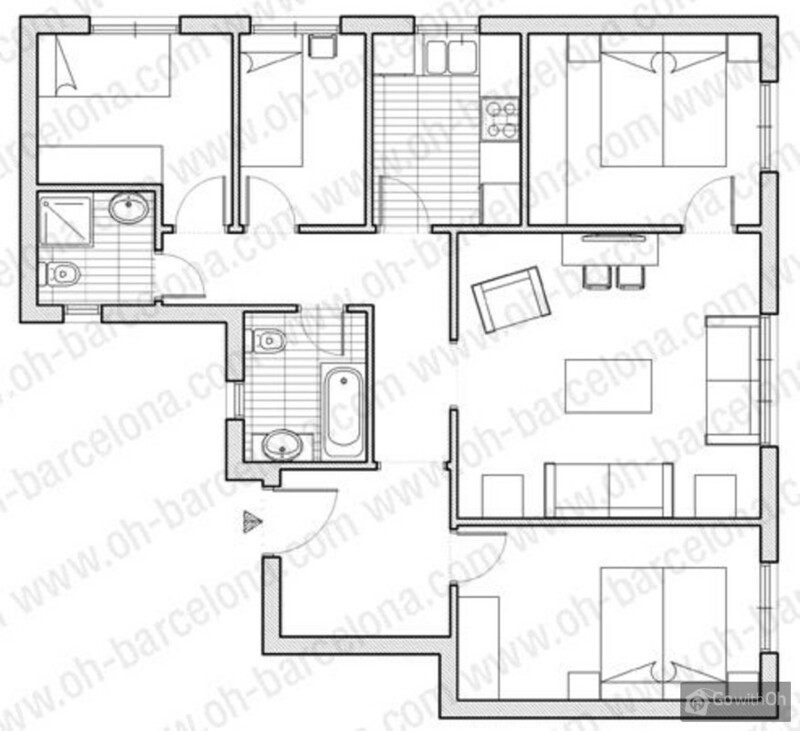 About oh-barcelona, what a great find. Would be happy to use again and again. Apartment was clean, spacious, and very affordable! It could be improved if there were some towels to wash dishes etc. Thank you. très efficace, et nous a donné de bonnes informations sur Barcelone. We felt the apartment could have been equipped better. There were no clocks, very few towels for the kitchen or bath, and the coffee pot was rusted. We also had to buy toilet paper about mid week. I think attention to a few details would make it a really nice place to stay. Appartement bien situé (proximité des metros). Appartement bien agencé avec tout le nécessaire pour un court séjour - fidèle au photographie. OH très fiable ! The appartment was fine, but it looked like it hadn't been used for a while. It would have been nice if it had been dusted and hovered. Quando abbiamo lasciato l'appartamento non siamo riusciti a fissare un appuntamento con il relativo proprietario per verificarne insieme lo stato : è giusto pretendere la cauzione da carta di credito di un appartamento il cui stato dopo l'utilizzo non viene verificato da nessuno? Il proprietario o ...chi ne fa le veci(l'agenzia) dovrebbe essere obbligato a verificare lo stato dell'immobile dopo l'utilizzo degli inquilini temporanei. Great Property,well maintained and comfy. The property was what I expected reading earlier reviews. Thoroughly enjoyed the stay. A great flat for an excellent holiday. I would die for a property with such great views of the city from every window in the property. 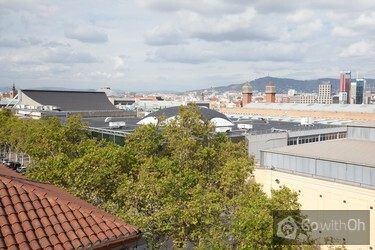 Great location as just a short walk to Espanya for transport links. EXCELLENT!!!! 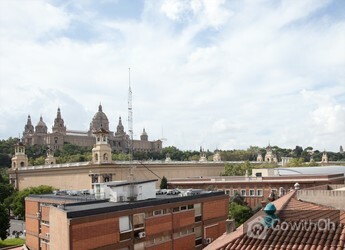 Die Wohnung liegt sehr zentral mit wunderbarem Ausblick auf Placa Espanya, Tibidabo und Sagrada Familia. Sie ist sehr gut ausgestattet (Klimaanlage, Waschmaschine, voll ausgestattete Küche etc.) und für spanische Verhältnisse auch sehr sauber und in einem sehr guten Zustand (von Kleinigkeiten ...abgesehen). Für Menschen, die absolute Ruhe zum Schlafen benötigen, ist sie jedoch nicht geeignet, da die Straße vor der Türe sowie die Aktivitäten am Placa Espanya für eine durchgehende Geräuschkulisse sorgen. Einkaufsmöglichkeiten befinden sich im näheren Umfeld, ebenso die Verkehrsmittel. Appartement calme et bien situé où rien ne manquait. Propre et en partie à neuf. Conforme à la description. 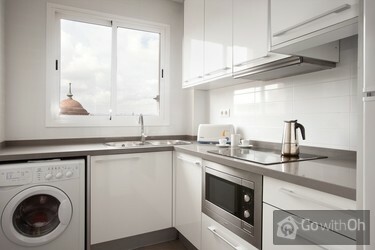 The apartment was clean, well located within the city and had everything we needed in the kitchen. It was better than I had hoped for. Simply said, the apartment allowed us to have the best vacation we have ever had. Barcelona is a great place to visit and as the apartment was located within walking... distance to stores and restaurants, it gave us great freedom to do as we wished with our time. Appartement ziet er keurig uit! ontvangst was zeer vriendelijk! hele vriendelijke man! Wat wij wel een groot min punt vonden is dat er geen sloten zitten op de badkamers! ( zit niet zo prettig op t toilet met het idee dat er iemand naar binnen kan. dus telkens aan elkaar vermelden dat we naar t ...toilet gingen. en een ander punt is dat de douche cabines heeeeel erg klein zijn. kon amper bewegen in douche( geen ruimte) je kan al helemaal niet bukken in de douche.je stootte je constant tegen de wand aan. De ligging van t appartement is perfect! en t is goed onderhouden. Toch wel trip naar centrum. Bel appartement, propre, agréable et confortable. Proche du métro pour se rendre en centre-ville rapidement. A wonderful, practical flat, equipped with what you need for a storter stay. Very nice and helpful staff. We had a wonderful time here. 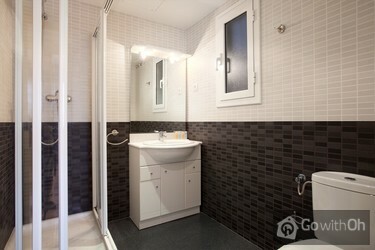 The apartment was in a great location and was a short walking distance to two different metro stops. It was situated in a great area for shopping, entertainment and dining. The apartment was quite large and perfect for 6 travelers. Major disappointment was lack of internet. It simply did not work what was obvious for the owner who did not do anything about it. There was no side lights in bedroom for reading in the evening and no dish washer in the kithchen. Dining, "sliding" table and chairs very basic. Beds and sofas ...very comfortable. Very nice view from widowns on Barcelona. 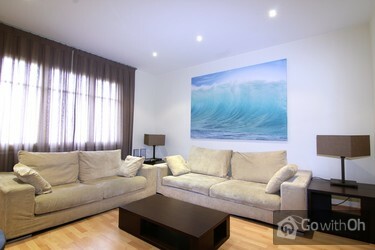 Very nice location, short walk to Placa de Espana and metro stations. Dear client, Oh would like to thank you for your comments. The owner confirms that the internet access has been revised and guarantees that it now works correctly. The apartment had good planning and equipment. Location was good as well. However there were cockroaches in the kitchen as a major turnoff. There were not a lot of them, but we killed ca 10 of them during our weekly stay. l'appartement est comme sur les photos, très propre(literie, coussins ) seul petit bémol: pas de double vitrage, donc un peu bruyant pour nous qui habitons au calme de la montagne...6 em étage avec ascenseur, belle vue. Apartamento luminoso, amplio, limpio, acogedor, funcional y muy agradable. Repetiremos en cuanto podamos. Altamente recomendable. Yes it was OK but I feel to add the following before giving to the next person in future: 1. Dustbin in Bathroom should be provided .2. There was no Lock in bathroom . Need to provide for future people with shared accommodations. 2. doormats should be provided in all rooms .3. Utensils were ...required to cook in microwave . Were missing .4. Heater was nok . it was taking time to cook food. rectify this 5. BED was nok as it some time fall down while sleeping . Service was OK but need enhancement . So marked as 7 . Need to provide the above mentioned services to the customer then next time onwards will get 10/10Thanks . Estimado cliente, agradecemos y valoramos sus comentarios. El propietario confirma haber revisado la calefacción, que ahora funciona correctamente.